First, let me apologize for the long hiatus. Perhaps you have started a new project with enthusiasm only to put it aside because of quotidian demands and general weariness? Ok, not a great excuse, but it is the truth. 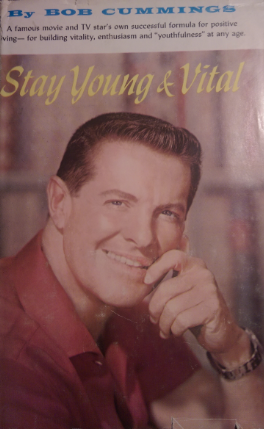 So it is fitting that we next review “Stay Young & Vital” by Bob Cummings. The book says it will help in “building vitality, enthusiasm and “youthfulness” at any age”. Now here’s something I can really use. It’s Vitameatavegamin on paper! There is something so deliciously retro about the words “vitality” and “enthusiasm”. I can remember watching ballet-shoed yet manly Jack LaLanne speak those words while urging my mom and me to do leg lifts. In case you didn’t know, Bob Cummings was an Emmy-award winning actor whose heyday was in the 1950’s and early 1960’s. He starred in numerous movies and in the eponymous “Bob Cummings Show”. Bob was married five times and had seven children, so he certainly had loads of vitality. 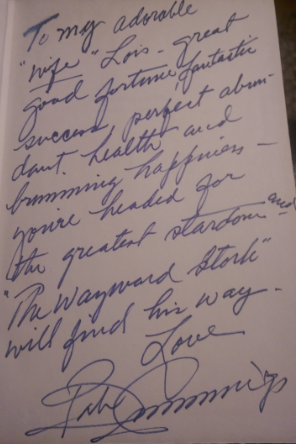 His enthusiasm is evident in the book inscription he wrote for my aunt, Lois Nettleton, when they both starred in the play “The Wayward Stork”. The book is chock-full of advice on how to eat well. It emphasizes consumption of protein, vitamins and minerals. Chapter headings are marvelously descriptive of early 60’s zeitgeist: “Chapter 1: Let’s Start Living” , “Chapter 5: The Mystery and Miracle of You” or “Chapter 7: The Seven Rules for Flying High”. Turns out that last chapter heading was literally true. Bob was flying high. He was a patient of the famous “Dr. Feelgood” otherwise known as Max Jacobson, the physician for JFK, Marilyn Monroe and many other Hollywood personalities. Dr. Jacobson did indeed administer vitamins and minerals, with a healthy kicker of amphetamines — known as the “miracle tissue regenerator”. The hyperbolic language in this case was not so charming and didn’t do Mr. Cummings any favors. Vitameatavegamin was was really just alcohol after all, so it shouldn’t surprise that vitality was found at the end of a needle. He was likely unaware, at least initially, that those miracle shots were the start of a lifelong addiction to amphetamines, ultimately costing him his marriage of 20 years and his career. It’s a sad story with an ending that surprised me, too. I was having such fun reading his book and listening to his Norman Vincent Peale-like admonitions. His positive style was the perfect antidote for my frayed nerves. That he turned out to have a drug addiction was a real shocker, but apparently this is a well-known Hollywood story. Yet Bob lived to 80 so perhaps he did know a thing or two about his topic. In the end, I thank him for his encouragement to my aunt and his optimistic outlook — obtained by whatever means. With that, dear readers, let me wish you abundant health and brimming happiness! Until next time.